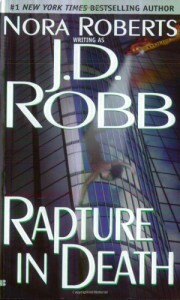 J.D Robb's In Death series is quickly making its way up my favorite series list. If anything, it keeps getting better with each book! This is really going to be just a quick, short review, cause I don't have much to say I haven't informer reviews of the series: It still has the same wonderful characters, still has wonderful plots, still has the same wonderful writing. RAPTURE IN DEATH begins in Eve and Roarke's honeymoon. If you haven't read the other books and don't know who those are, Eve is a homicide detective in a futuristic world. She's tough, intelligent, intuitive and cares a lot for the victims she investigates--even when no one else does. Roarke is the guy who owns half of that futuristic world (and who wasn't always on the right side of the law), a person whose name probably represents un-measurable wealth and influence in the dictionary, and the guy who managed to catch the tough detective. Both of those people have had a hard past, but both managed to make something of themselves despite of it. The two of them together make one of the better couples I've ever read about; they complete each other in a way that's absolutely amazing to read about. I can't imagine Eve or Roarke without one another.